Not everyone has the need or budget for a high-tech treadmill. However, even if you are buying a basic one to serve a general purpose at an affordable price, you still want a trusted, reliable, and safe product. In a market full of modestly-priced options, the Merit Fitness 715T Plus Treadmill stands out for a few different reasons. The Merit Fitness 715T Plus Treadmill receives very mixed reviews and it’s one of our least favorite treadmills. How Does the Merit Fitness 715T Plus Work? The Merit Fitness 715T Plus is ideal if you are starting a fitness routine or if you do a little more walking and jogging than actual running. It is motivated by a 2.5 THP drive motor to provide a smooth and consistent speed. You can increase your pace up to 10 mph, and there are three incline options, but they can only be achieved manually. The display is very straightforward. If you get frustrated by high-tech things or dislike scanning through menus to find what you are looking for, you will appreciate the no-frills design. A three-window LED display lets you track distance, time, calories burned, and speed. Plus, there is a thumb pulse monitor that displays your heart rate. The Merit Fitness 715T Plus has a weight capacity of up to 250 pounds, and it has a 47″ workout area that is large enough for walking and light jogging for most. To reduce stress to your joints and back, Merit has given this treadmill an Aerosoft cushioning system. It also offers four preset programs, if you want to add a little variety to your workout from time-to-time. 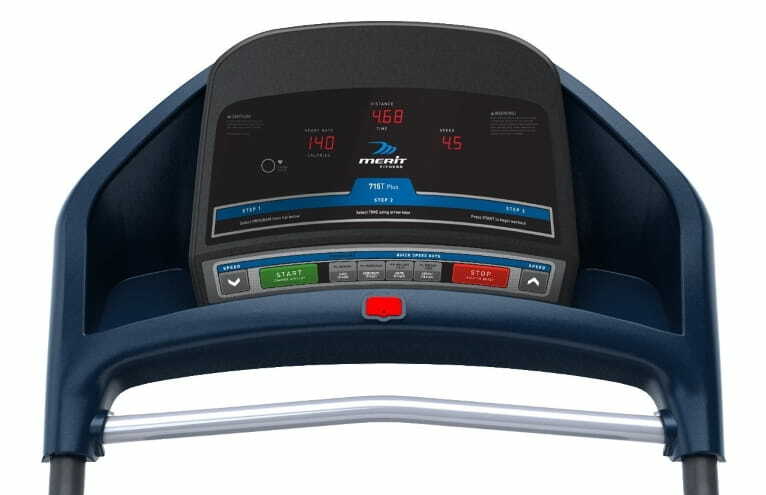 What Are the Health Benefits of Using the Merit Fitness 715T Plus? Running is one of the best activities you can do for your body, but even if you are not a full-fledged runner yet, this treadmill allows you to make positive changes to your health by walking or jogging. The important thing is to just get active. The Merit Fitness 715T Plus is so easy and convenient to use that you will have no excuse not to put in a few miles before work. To ensure that you do not overexert yourself, the heart rate monitor will help you work within your target heart rate zone. This will also give you a good indication if you should slow down the pace a little or manually increase the incline. Not only will you not have to deal with undesirable weather conditions outside, you will not have to put so much strain on your knees, back, and joints from jogging on the cement. The cushioning system of the deck will alleviate much of this discomfort. Folding frame makes for easy storage. Spacious 18″ x 47″ tread belt is accommodating to most users. Aerosoft cushioning system absorbs impact. Three-window LED display lets you track distance, time, speed, calories burned, and more. Three-position manual elevation adjustments allows for a more intense workout. Weigh capacity up to 250 pounds. Lifetime warranty on frame and the motor is covered for 1 year, while parts and labor are covered for up to 90 days. You could look for the Merit Fitness 715T Plus in local retail stores and online retail locations. However, we recommend Amazon for this type of purchase. It is one of the most secure and trusted sites on the Web and its customer service are phenomenal. Plus, you will not have to struggle to load the box in your vehicle to drive it home from the store. Not to mention, it is only $349.99 at Amazon and you get free shipping. It sells for $457.50 at other retailers. We recommend the Merit Fitness 715T Plus for a walking/jogging routine, but not for a serious runner. We do like that the interface is simple, the deck is cushioned, and it folds for easy storage. However, not having an automatic incline and decline is a definite disadvantage. Not many runners will want to stop their workout to adjust the incline once they find their stride. Also, placing your thumb on the pulse indicator when you are running is a little awkward, but again, if you are walking, this may not be a big deal. If you want to know what other users are saying about this treadmill, you will find more than 100 reviews on Amazon. Reading them should be more than enough to help you make your decision. You will find that those without super-sized expectations were quite pleased with this budget-friendly option.